The tree is equipped with a 105 LED-bulb amber light set that plugs into a household outlet. 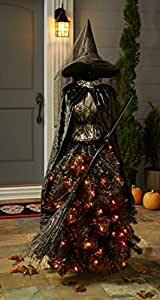 Create your own haunted home with this five-foot tall, pre-lit Halloween tree, featuring an elegant yet spooky witch form. The witch wears a black and gold dress, a velvet cap and a velvet hat with netting, and has a broom in her hand. The tree is equipped with a 105 LED-bulb amber light set that plugs into a household outlet.